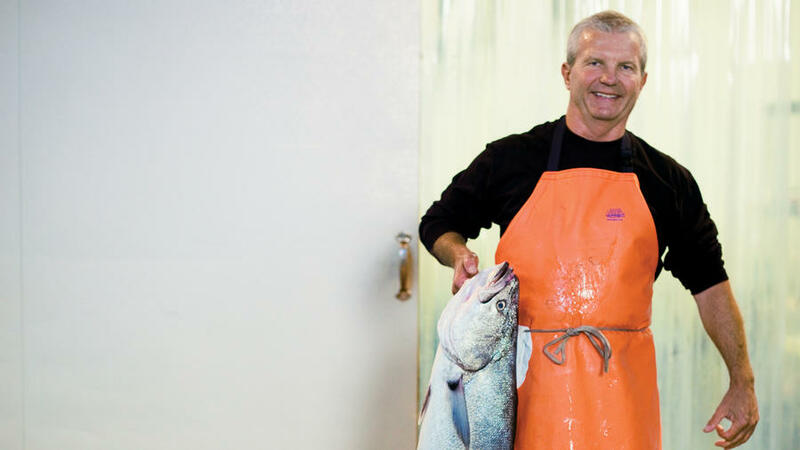 Fishmonger Paul Johnson holds a white seabass caught off Seal Rock in San Francisco. These are some places meet at least two of our criteria for smart fish shops. 1. A variety of sustainable seafood choices. 2. A person behind the counter who can answer your questions. 3. A label on each fish, listing source; whether farmed or wild; and how it was caught. 4. Lots of brochures from sustainable seafood suppliers and organizations on the counter. In many areas, Whole Foods Market and Walmart have the best selection; both companies have sustainable seafood programs that are continually improving. Several of the stores we list sell seafood that’s not sustainable along with the sustainable, but they can direct you to their best choices (and at least they have them). Also, remember that buying directly from your local fisherman ― usually at the farmers’ market ― is often a great option, because who better to tell you exactly how the fish was caught? California is the first state to have a regional guide to direct-from-fisherman purchases, at the Institute for Fisheries Resources. We hope that the institute will offer guides for other states soon. Costa Mesa, Santa Monica Santa Monica Seafood Co.
To search for additional markets in your area that sell sustainable seafood, try FishWise and Greenpeace. Tell us about your favorite sustainable seafood shops. Which is Better, Farmed or Wild?